When we are talking about Gujarat, the first thing that comes to my mind is our BM 25 meet. It was three days of absolute masti. Thanks to Vaishali, she saw to it that we were well settled, well taken care off and well fed! So it’s only natural that when it came to Gujarat, I was browsing Vaishali’s space for recipes and ideas. Then I remembered this post from my friend (old room-mate) Roshni of Roshni’s Kitchen. She had actually put up a thali with Vaishali’s help. So I based mine on that one and modified it a little bit. I wanted to make the chaas, the salad and the chutney as well like Roshni’s thali, but ….errrrr…forgot about it. Going through Vaishali’s space, I came across this very different combination of beans, peas and cooked whole wheat discs(dhokli). I included that in the thali and it turned out to be a good decision. The kid loved the atta (whole wheat) discs. 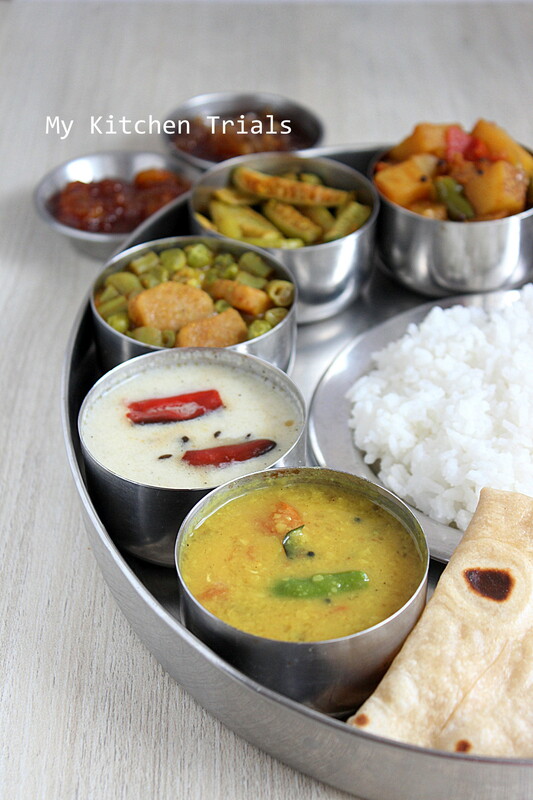 I had made a Gujarati thali before as well. There Vaishali had mentioned that Gujarati kadhi doesn’t have turmeric in it. So this time I went right into her space and followed her instructions. In the same post of hers, she has the recipe for the potato curry as well. Scroll down for the recipe. Dingiri Batata Nu Shaak : Potatoes cooked with onions and tomatoes. 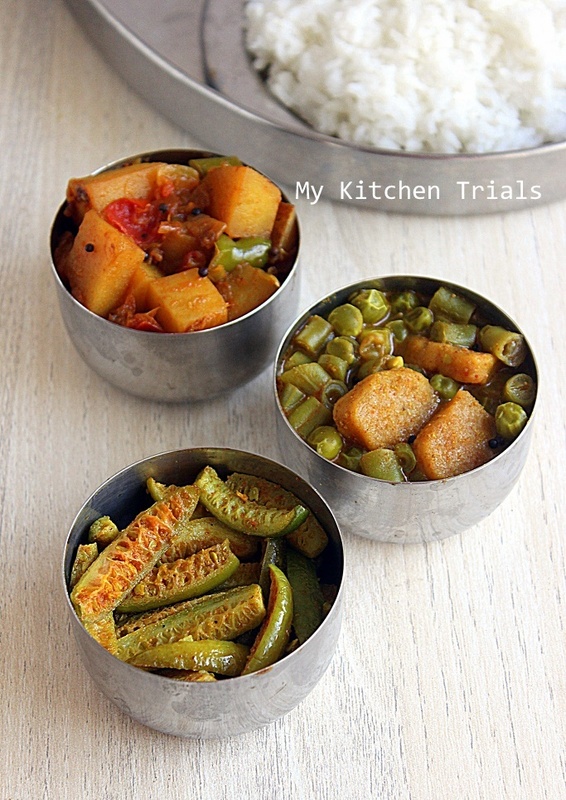 Fansi Dhokli : Beans, peas and whole wheat atta discs with some masalas create the magic here. 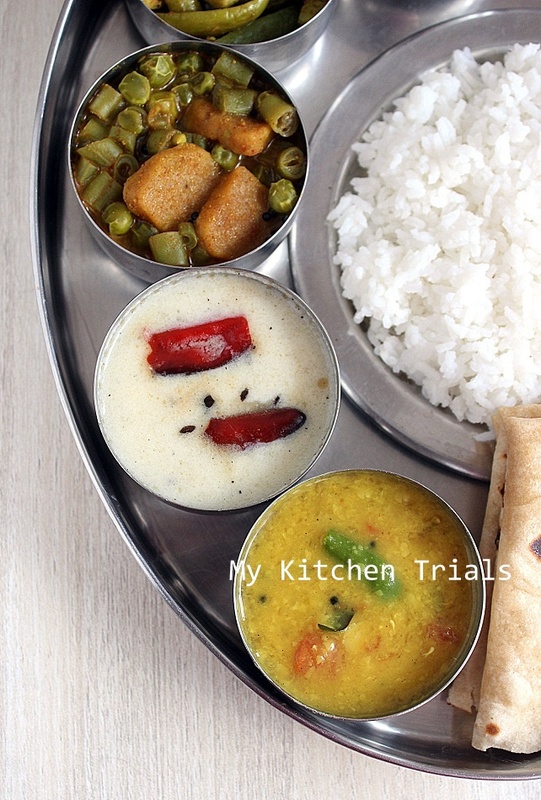 Gujarati Kadhi : The whitish yogurt based preparation. No turmeric is used in this recipe. Gujarati Dal : Simple dal. Skipped the sugar to stick to the spicy version. Rotli : Very thin, soft roti-like rolls. Maida (all purpose flour) is used for rolling out the dough. 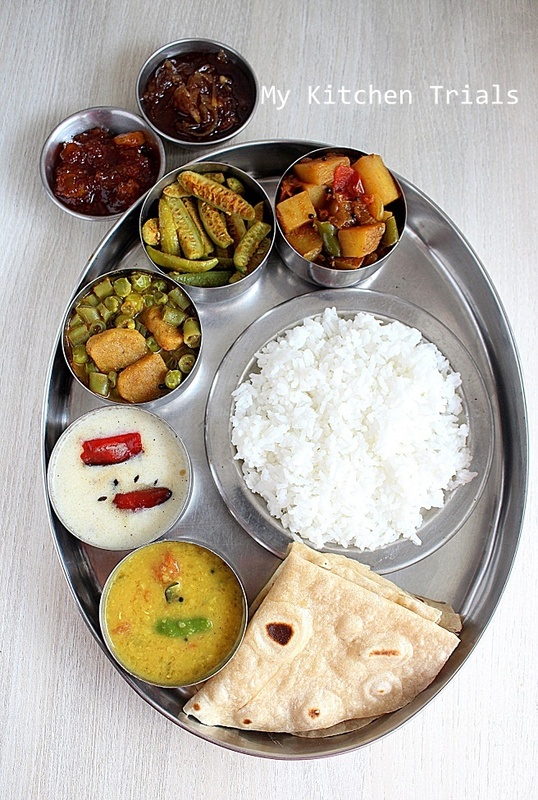 Its going to be late nite and i cant resist to drool here over that place of this mini and droolworthy thali.. Wish i could make as much as thalis like u.
which one should I choose? the entire plate is super tempting!! Creating magic with yet another thali.. Lovely meal! 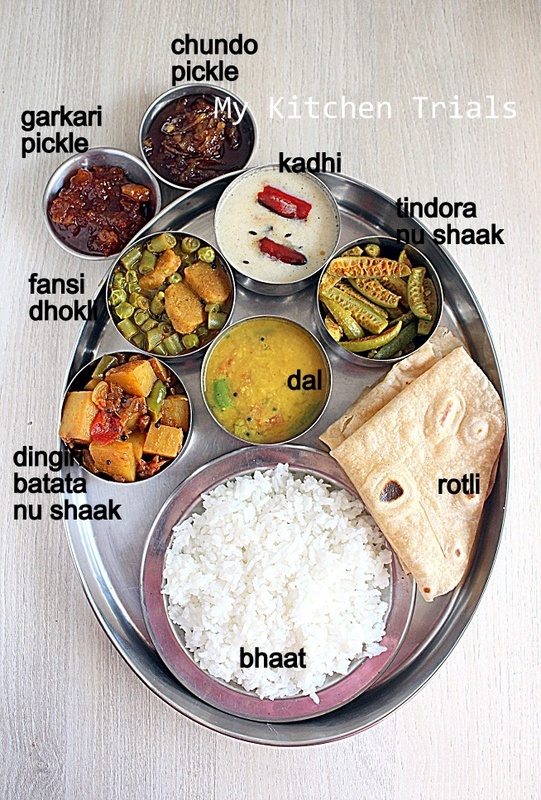 Thali is very tempting. Tindora is appetizing. nad fansi dhokla sounds interesting. What a gorgeous spread there…lovely ! So beautifully done Rajani..your thalis are so well plated and matching..very good job! Yes Mishti, the roti was made of atta. Maida is used for rolling it out. One more thing, your blog is awesome and the recent posts on thalis is too good. And the way you do photography, no one can imagine the food can be looked so good and attractive. Keep it up. Thank you. Thanks a ton Mishti :-). And thanks for the rice flour tip as well. Will try it out for sure :-). This platter looks amazing Rajani. Want to grab and finish the stuff. Was just reading Mistis comment Rajani. I roll out with atta only and MIL used rice flour. Your thalis are so very delicious. I am coming over so that you can feed me this and teach me to take pics.Just cannot get my eyes off the pics. I referred to your previous Gujarati thali to make mine for BM and here you are with an other one. Everything looks yumm!! Lovely spread of dishes.. Yum. The Gujju thali is so well made, I had loved Roshini’s thali too..you girls put in lot of effort ..but totally stunning! !